Operational reporting is not the same as being data-driven. We all have our reports we have to submit, whether for Title V, RECLAIM, greenhouse gas reporting, or the recently adopted suite of fenceline monitoring rules. Although all of these reports are operational, they also involve collecting massive amounts of data, most of which sits unused. As a scientist, I’m here to tell you that there’s great value in that data — if you invest the time and money to properly analyze it. So if you’re going to go through all the trouble of collecting piles of data for RECLAIM, Title V, and what have you, I strongly urge you to take a few extra steps and analyze it. Yes, it takes more work. Yes, it’s going to cost more. But the benefits could mean the difference between staying the course and giving your business a serious kick in the pants. A maturity model is a tool that helps people assess the current effectiveness of a person or group and supports figuring out what capabilities they need to acquire next in order to improve their performance. 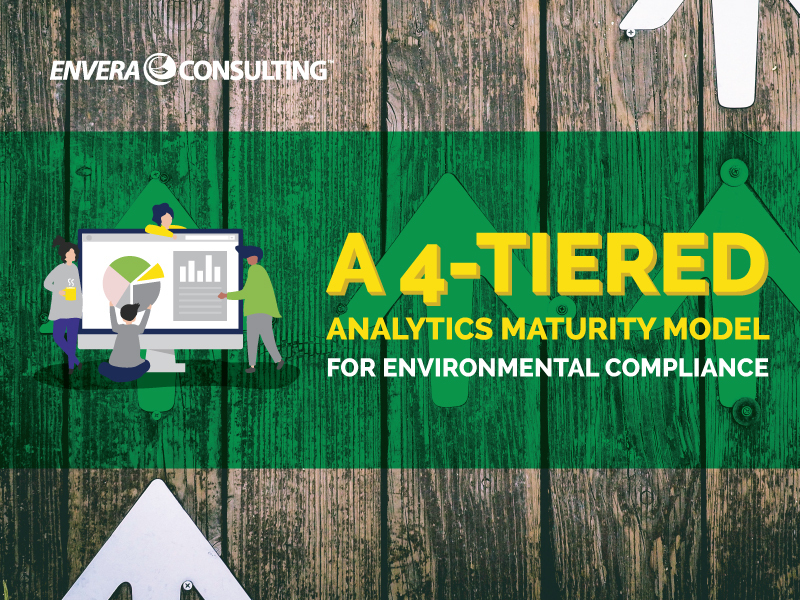 Even though the context of Deloitte’s maturity model is rooted in talent retention from an HR perspective, the model caught my eye because the four levels it describes could apply to any industry — yes, even air quality compliance and environmental management. So, tweaking Deloitte’s model, I’ve come up with a four-tiered maturity model for air quality/environmental compliance, ranked by how much a company uses and analyzes its data. Which level is your organization currently at? Most of the data-related work in air quality or environmental compliance is rooted in operational reporting (think Title V reports and all the others mentioned above). Operational reporting generally starts with looking at process data, such as the temperature of the roast drum of a coffee roaster or the pressure inside of a given vessel. You then perform a level of data reduction (clearing/aggregating) and report to an agency. These three labor-intensive and time-consuming steps — monitoring, recordkeeping, and reporting — comprise what we at Envera like to call the compliance trifecta. In my experience, companies often begin at this level and slowly move up. However, that movement only happens if management recognizes the need to do more — some folks are perfectly happy with the don’t-fix-what-ain’t-broke mentality. Plus, why create more work or spend more money? It’s easier to get by just doing the bare minimum — i.e., only what the reports require. Within an advanced reporting environment, data is funneled into reporting platforms, such as an ERP (enterprise resource planning) or similar system, which automate many of the routine reports needed for compliance. Automation allows for a big-picture overview of the current state of affairs via the system’s dashboards and benchmarking. Dashboards provide overviews such as summaries of Title V deviations to date and the amount of natural gas used during a given time period, while benchmarks provide a reference point to the dashboard’s data, such as the average number of deviations at similar plants across the country within the same time period. At this level, data may start to be combined from different data sources within the organization. For example, let’s say that the dashboard shows that your facility had 24 Title V deviations in the last six months, which is 1.8 times the baseline across all similar facilities in the U.S. Now we’re starting to get insight into the inner workings of a compliance program. Now that many of the operational reports are being automated, it’s possible to see what’s really working and what’s not by comparing your stats to those of other facilities. In a level 3 organization, there is sufficient data and resources to make strategic, proactive business decisions. In certain cases, statistical analysis can be done on the data, allowing staff to run through various what-if scenarios. All of this allows management to be proactive in running the facility because future decisions can be made and shaped based on past trends. As an example, your facility might now learn that there is a 68% chance that the refinery will have five or more deviations of 40 CFR 60 Subpart J if 31% of November’s crude composition comes from Ecuador. With this information in hand, you can plan ahead by making the necessary adjustments in plant operations to avoid these deviations. The holy grail of a data-driven environment is to make predictions — in other words, you’re proactive rather than reactive. At level 4, predictive models are built and used to facilitate the decision-making process. Complex what-if cases can be studied and contingency plans developed. Data comes from multiple sources both within and outside the organization (such as weather information or social listening statistics) to build context, and outcomes are modeled and studied. Decisions can be made that affect longer-term timeframes. Yes, you’re spending more time and money, but in the end, those investments can pay off by preventing noncompliance issues from occurring in the first place — which means the likelihood of getting a dreaded notice of violation goes way down. As an example, it now becomes possible to know that if the pressure in vessel V-134 exceeds 10 PSI, the ground-level concentration of benzene at the fenceline might exceed 10 PPM in 2.5 hours. Knowing this, the vessel pressure can be regulated to minimize the environmental impact at the fenceline. While there are many ways to get to the fourth level, you won’t get there without taking a realistic and holistic view of where you are and what it’ll take to get there. That may mean you’ve got a rough road ahead, but if your organization wants to reap the benefits that so many others have, it’s an investment you’re going to need to make.